I started a new project. I've wanted a thickness sander for quite awhile, but could never justify the cost for the amount of use that I would put it to. So, that left the option of making it myself. 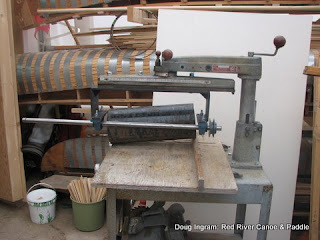 There are quite a few plans around for these DIY machines, and I was set to make one. That is, until I found this old Delta radial arm saw at the dump last fall. I figures that it had a solid column with a perfectly good raising and lowering mechanism. So I had a bar made to hold the pillow blocks which will support a 6" diameter steel drum. Abrasive paper will be wrapped around the drum. You can see the steel shaft which is a little long just now. Still need to set up the motor, make the dust collection shroud, mount the drum, and make a proper table. But it's a great start! Posted by Doug Ingram at 11:01 p.m.